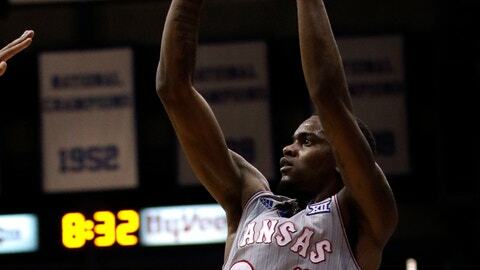 LAWRENCE, Kan. (AP) — Kansas guard Lagerald Vick followed his underwhelming season-opening performance against Michigan State with what Bill Self called the best offensive performance of anybody he’s ever coached. Vick went 8 for 8 from outside the 3-point arc. He hit two more deep 2s with his foot on the line. And the only shots he missed were a short hook and what Self called “a dipsy-do layup,” giving the senior a career-high 32 points in an 84-68 victory over Vermont on Monday night. Vick got some help from Udoka Azubuike, who had 23 points and 11 rebounds, and Devon Dotson, who kept finding Vick open on the perimeter while adding 10 points and 10 assists for the second-ranked Jayhawks. Kansas (2-0) was jumped by Duke for the top spot in the AP poll earlier in the day, even though it beat the No. 10 Spartans in the Champions Classic last week. And for most of their game against the Catamounts (1-1), the Jayhawks did little to prove the voters wrong. They led just 40-36 at halftime before two big runs allowed Self to breathe easy. The Catamounts looked as if that streak might end when they went on an early 18-4 run, hitting a series of quick 3-pointers while double-teaming Azubuike on defense whenever he got the ball. The Jayhawks’ 7-footer still muscled his way to 12 first-half points. But while the Catamounts sent waves of bodies at Azubuike inside, and made fellow Kansas forward Dedric Lawson a non-factor, they didn’t account for Vick on the perimeter. After struggling mightily in the Jayhawks’ season-opening win over the Spartans, Vick poured in four first-half 3s and piled up 16 points. Most of them came as the Jayhawks struggled to run offense through their two freshman guards, Dotson and Quentin Grimes. Eventually, the Jayhawks’ depth and talent wore down Vermont. It was 44-40 before Azubuike added another of his rim-rattling dunks and then scored on a putback. Vick followed a jumper with his sixth 3-pointer and added his seventh a couple of minutes later as the Jayhawks’ lead swelled to 61-45 midway through the second half. Vermont went on one last run to get its deficit under 10, but Azubuike added two more baskets and Vick curled in his eighth 3-pointer. That matched Mario Chalmers for most in the Self era at Kansas and left Vick trailing only Terry Brown, who hit 11 in a game in 1991. Vick finished 12 of 14 from the field in helping Kansas win its 46th straight home opener. Vermont has not beaten a Big 12 opponent since former member Colorado in 2008. … The Catamounts had 11 assists to 12 turnovers. … Kansas has not dropped a home opener since losing to Vanderbilt on Dec. 2, 1972. … The Jayhawks finished 12 of 19 from the 3-point line. Vermont: The favorites to win America East did nothing to diminish their outlook, standing toe-to-toe with the reigning Big 12 champs for nearly 30 minutes. In a league where they should match up better physically, keep an eye on Vermont to roll toward another NCAA Tournament appearance. Kansas: Lawson followed his excellent debut against the Spartans, when he had 20 points and 14 boards, with a dud at the Phog. The transfer from Memphis and the Big 12’s preseason player of the year was held scoreless on 0-for-6 shooting. Vermont plays its home opener against Northern Vermont-Lyndon on Wednesday night. Kansas plays Louisiana on Friday night before heading to New York for the NIT semifinals.